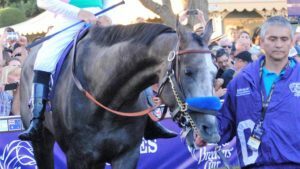 The horse rated as the best in the world will be in the stables at the Del Mar Racetrack when thoroughbred racing returns Wednesday for the 78th summer season. However, fans will have to wait a few days to see Arrogate, who will run Saturday in the $200,000 TVG San Diego Handicap. He also might compete in the premier race of the Del Mar summer slate, the $1 million TVG Pacific Classic on Aug. 19. Arrogate, who won at Del Mar last August, is on a seven-race winning streak, including a victory in the Breeders’ Cup Classic, and has earned a North American record of more than $17 million. The 4-year-old has had the last four months off. For opening day, the highlights will be the annual hat contest and the $100,000 Oceanside Stakes, with a 14-horse field of 3-year-olds competing on the infield grass track. Around 40,000 fans are expected to attend, with the first post at 2 p.m.
More than $5,000 in prizes is up for grabs in the Opening Day Hats contest in the Plaza de Mexico. Categories include most glamorous, best racing theme, funniest/most outrageous, best fascinator and flowers/all other. There is no fee to participate, and the grand prize winner will receive a one-night stay at the Fairmount Grand Del Mar and dinner for two at Addison Restaurant, valued at more than $1,000. Winners in each category receive $300 plus a Studio Savvy gift basket valued at $250. Second place is worth $200 and third place $100. According to the Del Mar Thoroughbred Club, the 36-day summer season will include five races in the Breeders’ Cup Challenge Series, which will serve as qualifiers for the Breeders’ Cup World Championships, which will take place at Del Mar for the first time Nov. 3-4. Racing will take place Wednesday through Sunday until closing day, which is on Labor Day Monday. Parking is available on-site. Fans can also ride Amtrak or the North County Transit District’s Coaster trains or buses to the Solana Beach station, where they can meet a shuttle bus to the track. The NCTD will augment its Coaster schedule with two additional trains both southbound from Oceanside and northbound from downtown San Diego. In addition to the regular Coaster schedule, the southbound trains will leave the Oceanside Transit Center at 11:20 a.m. and 6:42 p.m. The additional northbound runs will depart Solana Beach at 1:09 p.m. and 8:50 p.m. The DMTC has also established a partnership with ride-hailing service Uber to provide transportation to and from the racetrack.